I always thought I’d go the iPad route. I’d certainly thought about it. Still, it is hard to rationalise $700-$800, and then you really want the 3G version, which costs you more for the internet too!!! But then, in 2010, we decided to do a family Kris Kringle again. Instead of getting a bunch of small gifts, I was getting one big one. 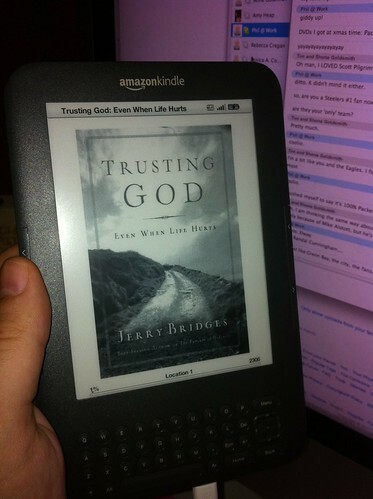 I couldn’t think of anything else, then one day, messing about on the internet, I came up with the idea of the Kindle. It was a little over the Kringle limit, but I was happy to make the difference (and as it turned out, my sister was happy to spring for it anyway), so I spoke to the person who had me for a gift (we’re all so hard to shop for, evidently, that we end ups speaking to each other about ideas…) and the Kindle was ordered. My only frustration with it was that it didn’t arrive till January 17th…. but at least they warned us! I have to say that I am sold! 200,000,000 odd books that are available for free, thanks to being copy write free. If you like classics like Doestoevsky, Luther, or Wilde, then that alone is a sweet deal. It’s also a fair bit cheaper to buy normal books! In particular, I love the idea that right now I am carrying a little over 60 books with me in something the size of a paperback! In some ways it is funny, cause I was always the one who said I would wear “Eau de musty book” if they ever made it as an aftershave. I’m still the one who enjoys the tactile aspects of reading, but boy, convenience does sneak in on you too! So, would you ever use a kindle if you had one? What’s your favourite thing about real books? So, would you ever use a kindle if you had one? No. Categorically No. They take me on a physical journey. My bookmark moves along with the story. The feel of them in my hands. I can write in the margins and circle things. My library. I love owning books I’ve read – I see where I’ve been. They are social – I can lend them and borrow them. They form part of the texture of my home. They don’t get flat batteries. i wonder if Horse & Sulky drivers said the same thing when cars came into being? In many ways I have the same feelings as Al. I will never want real books not to be in my life. Thankfully we don’t have to choose between them. There are certainly times when I would love to put many books onto a small device and travel light. At the moment, as a librarian, I have access to all the books I want for free. E-books may be cheaper than print books but I am not used to paying anything at all. One day, when all devices read the same formats and you can borrow a decent selection of titles from your public library for free, I’ll buy an e-reader. I would love a proper look at your Kindle!